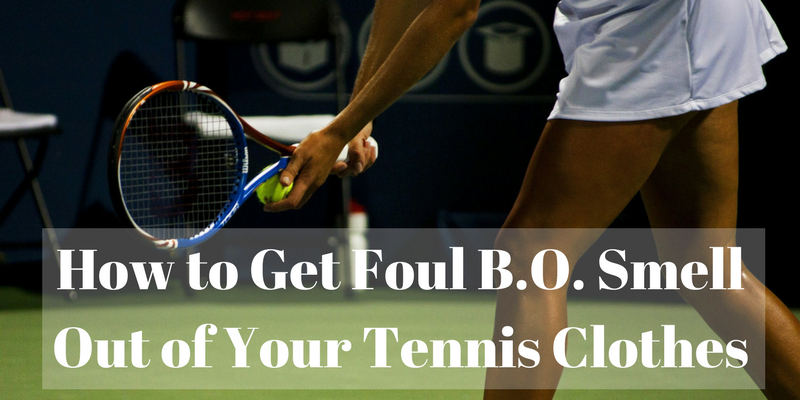 Stepping off the court, a victory isn’t the only thing you carry with you from the match. Smelly sweat odors have attached to your clothes like a magnet, embedding deep into the fabrics of your sport clothes. Sweat odors can really make their mark on your clothes, making it insanely difficult to remove with just your simple everyday laundry process. These odors require a little extra TLC, because, let’s be real, after an intense workout your clothes can smell to the point of wanting to toss them into the dumpster! But wait. Before you go throwing your clothes away in pure frustration, there are ways to finally say goodbye to sweat odors in your clothes even after you have already washed them to no avail, with no results. Why Do My Workout Clothes Smell After Washing Them? Have you ever washed a load of workout clothes to have them come out smelling just as bad as when you threw them in to begin? The fabric of your workout clothes could be making your washing machine’s job just a little bit harder. Synthetic fabrics used for athletic wear are prone to retaining odors and trapping moisture in the confines of the fabric making it hard to penetrate these odors in the washing machine. These fabrics are also designed to repel water, which is ideal for when you are working up a major sweat in your exercise pursuits but when you are trying to remove these harsh sweat odors in your clothes it can be a little tricky to get the odor absolved from the fabric. Certain steps in your laundry process can be adversely affecting your mission to get rid of sweat odors in your workout clothes. Even though you may just be following your everyday laundry routine there are some laundry practices you should avoid using on your synthetic fabric workout clothes. Following these tips can help you to erase sweaty gym odors from your fabrics and get your workout clothes smelling as if they were brand new again. Coming back from the gym dripping sweat, your first reaction is to strip out of your gym clothes and throw them in your laundry hamper ASAP. 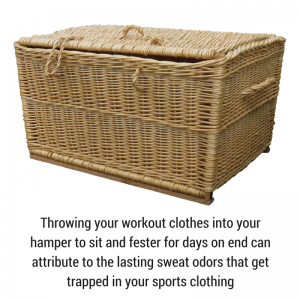 However, throwing your workout clothes into your hamper to sit and fester for days on end can attribute to the lasting sweat odors that get trapped in your sports clothing. We don’t always want to do laundry the day we workout, meaning our workout clothes will sit and build up layers of soil and bacteria in anticipation of laundry day. Research shows that bacteria will collect on your sweaty workout clothes when they sit for an extended period of time. So, if you plan to wait until laundry day to wash your sweaty workout clothes, it can be helpful to allow the sweaty clothes to air dry before tossing it into your laundry hamper to minimize the risk of potential mildew growth on your clothes. More detergent equals better results, right? Logically it makes sense to add more detergent to get your clothes smelling extra good but that’s not the case, especially with high-performance workout fabrics. Most active wear is made using microfibers containing Lycra and Spandex that repel water, and when you try to wash these clothes they will hold onto detergents and trap dead skin as well as harbor fungus in the material. Also, added fragrances in the detergent can also attribute to foul odors on your clothing after you wash them. Many detergents contain masking agents to help mask the odor smell rather than actually removing the odor in the clothing. 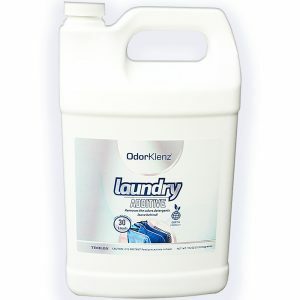 Using a non-toxic, clear and free detergent can help to eliminate added odors onto your clothes. You may also want to consider adding an active sport laundry additive to your laundry routine when dealing with strong sweat odors on clothes. 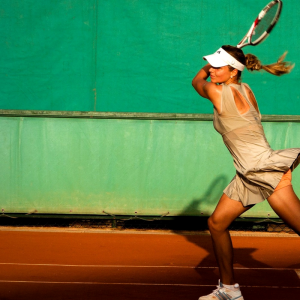 A sport laundry additive is specifically designed to work on sweat odors and can be extremely useful when washing strong odors caused by sweat. The temperature you use when you wash your clothes can severely impact your washing results when cleaning your workout clothes. Many like to wash their workout clothes in hot water to ensure that they kill all the sweat odors and bacteria festering on the fabric of their clothes, however, you may want to reconsider this washing process. Most athletic wear advises on the washing directions to wash on a gentle, cold-water cycle to help increase the life of the fabrics. When you wash these fabrics in hot water they tend to not only shrink the pieces of fabric but they also start to break down the actual material of the clothing. Athletic apparel can run very pricey so you want to make sure you are taking care of these pieces of clothes when you are washing them. Stay clear of using any fabric softeners when you are washing any and all workout clothes. Fabric softeners leave behind a film of coated fibers that create that silky touch that many love but it also leaves behind a film that traps odors and bacteria in your clothes. It can take several washes after using a fabric softener to remove this coating. Also, fabric softeners tear down the elastic fibers that give workout clothes their stretch which is one of the main functionalities of the material for working out. Nobody wants to work out in baggy clothes that are falling off when they exercise. Heat is not a friend to your athletic apparel, so drying your gym clothes can be adversely effective when cleaning your workout clothes. Just like washing your clothes in hot water, drying your clothes in warm temperatures can shrink or even warp your clothing. Also, something to keep in mind is that the material for most workout clothes is made to dry quickly when you sweat, so they tend to dry very quickly when placed in the dryer. If you do choose to dry your sport clothes, be sure to place your dryer on a low setting to minimize the time they spend in the dryer. You also want to separate your workout clothes from your other laundry because your workout clothes will spend a good portion of time in the dryer baking because of the extra time your other laundry requires to fully dry. Washing your workout clothes can create some major challenges in your laundry routine. 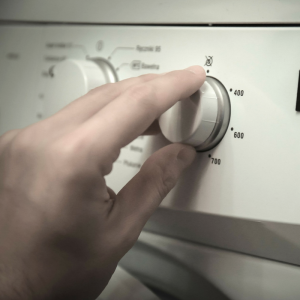 It can sometimes be downright frustrating dealing with tough sweat odors that you feel are impenetrable, so impenetrable that not even the washing machine will take care of the odors. Taking the tips above and implementing them in your laundry care process for your sports clothes can help you to finally get rid of sweat odors for good.